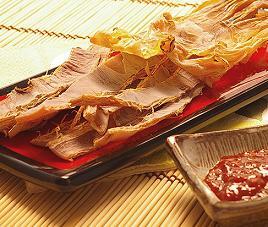 Ojinguhs are popular dry food snacks and it’s the closest equivalent of a Korean beef jerky. Instead of beef, however, ojinguh’s are dried squids which are readily available in the packaged goods section of your local Korean supermarket. This snack is enjoyed by Koreans of all ages but especially popular while drinking beer or soju as “anju” or drinking snacks. To prepare them at home, they can be easily be cooked on gas stovetops over low to medium flames and/or using frying pans over electric stovetops. Both sides are evenly cooked and then stripped into thinner pieces to be eaten plain or dipped in mayo and/or gochujang as its dipping sauce. Other popular dipping sauce can be mustard or even tobasco sauce.